You currrently have no products in your basket, how about this? What is the Aerosolv system? – Our Aerosolv system allow the customer to completely empty and safely trap excessive gas from used aerosols making the used cans SAFE and READY for STANDARD recycling. Why use the Aerosolv system? – Traditionally customers need to use a registered safe collection and recycling company. Typically they can store on average 96 potentially unsafe cans in a 205 litre drum. The cost of collection and disposal of the drum is around £200.00 per drum. 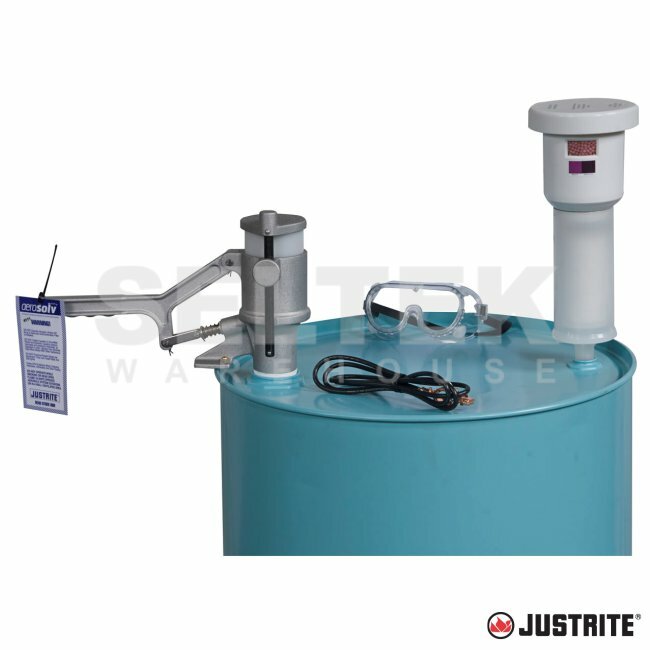 With the Aerosolv system you can empty safely around 4200 cans into a single 205 litre drum. 1 Drum will be the same £200.00 recycling cost compared to around 43 drums for the same amount of cans x £200.00 = £8600.00. Why buy the Aersolv system? TO SAVE £1000’s ON RECYCLING COSTS EVERY YEAR. Punctured, discharged, cans do not meet the definition of hazardous waste per EPA 40 CFR 261.23(a) (6), and thus can be treated as recyclable scrap metal. 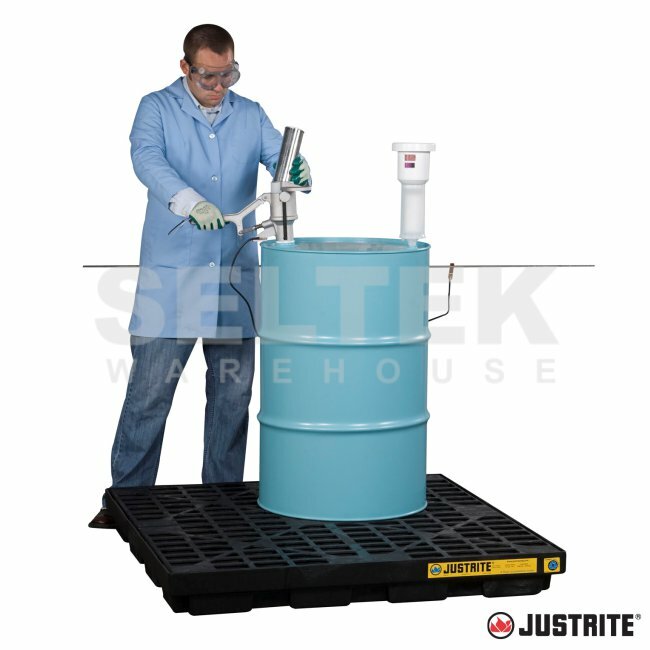 One single 55-gallon (200L) drum holds approximately 4,200 spent aerosol cans. Aerosolv® punctures and relieves pressure of spent aerosol cans, changing them from solid hazardous waste to a non-hazardous state. Option 2 - Aerosolv® - Average contents of 4200 cans @ £200 per drum = £0.05 per can AND you can now re-cycle the steel can. The Aerosolv® cast-aluminium body threads into a standard 2" (51mm) bung on a 30- (110L) or 55-gallon (200L) drum. Aerosolv® accepts industry standard sized cans with a maximum height of 8½" (215-mm). Simply place an aerosol can into the unit, lock the lid to secure can in place, and then push down on the lever. The durable, non-sparking piercing pin punctures the can, and the residual liquids flow directly into the collection drum. Residual propellants are filtered of VOCs by the two-part combination filter that threads directly to the 3/4" bung. The base coalescing cartridge transforms residual liquids into droplets that collect in the reservoir of the coalescing cartridge, allowing for easy drainage, directly into the drum if desired. The activated carbon filter cartridge signals saturation and serves as a replacement reminder. Economical, non colour-changing filter is also available. 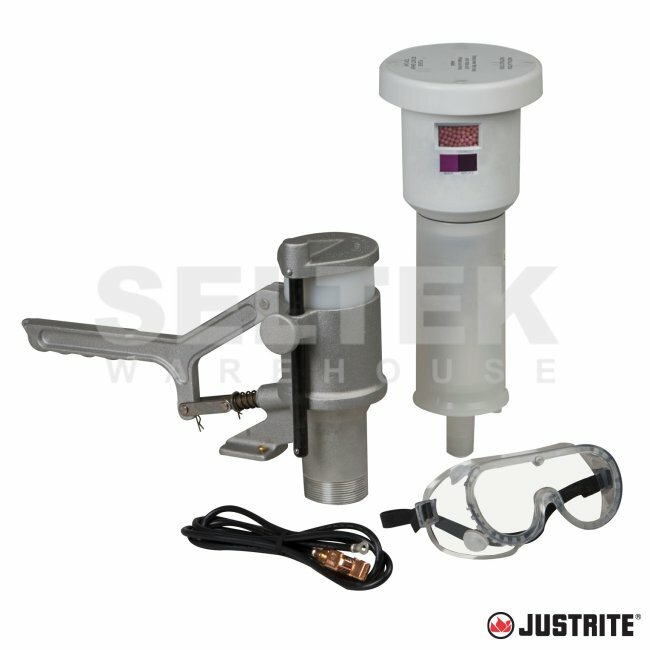 System includes combination filter, safety goggles, and an anti-static ground wire with alligator clip. The majority of our products include free delivery to mainland UK (Excluding some Scottish Postcodes) unless otherwise stated. All delivery or despatch dates quoted are an estimate based on the latest stock information we have. We monitor delivery times and will make you aware of any significant delays. Volume orders of large items can increase delivery time. Small items up to and including mobile steps (not warehouse steps) are delivered next day from leaving the factory. Medium weight items including large trolleys, spreaders, grit bins and cabinets are normally despatched on a 2-3 working day carrier. Large items including trailers, large warehouse steps and larger volume orders will despatch on 3-5 working day carriers. All deliveries off-shore and to the Scottish highlands will add at least 2 working days delivery. Important information for Scottish, Highland and Island customers only. Alternatively please check-out using the ‘proforma’ option we will then verify any extra costs before sending you the proforma, you can then pay by card by telephone if you wish to proceed with the order. If you have any questions please contact us – we are here to help.